Despite the risks of dying without a Will (referred to as dying intestate), 60% of the population are still not putting their affairs in order before it’s too late to do so. Wills are not just for those of advancing years, while the truth may be uncomfortable to consider, we are all vulnerable to accident or disease on any given day. Drafting a Will is important to ensure your wishes are carried out after your death, and for family members who will be coming to terms with your departure, the stress and anxiety of fighting for inheritance will be alleviated. Why should you draft a Will? Wills are also used to structure the Testator's estate in a tax-efficient manner and reduce Inheritance Tax. The primary reason to draft a Will, however, is to avoid dying intestate; a situation whereby the decisions regarding what happens to your estate are made for you by predefined rules – the Rules of Intestacy. These rules define the order in which family will benefit from the estate of the deceased individual; spouses/civil partners, children/grandchildren, parents, siblings, grandparents, then uncles and aunties. Under the Rules, if there are children involved, the first £250,000 of an estate will transfer to the spouse/civil partner, plus half of the remainder – with the children receiving the other half of the residual estate. It is natural to assume that after death, your family will act fairly and cooperatively in respect of inheritance. Unfortunately, not having a Will to refer to can lead to family discord. Wills are highly beneficial because they make your wishes clear, thereby removing the potential for arguments following your death. Also, without a Will, part of your estate may pass to family members with who you have little involvement or who you would expressly not wish to receive part of your estate. 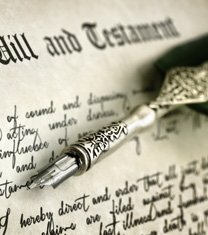 If you had planned to pass part of your estate to persons outside of your family, including, cohabitants or unmarried partners, ex-spouses or civil partners, step-parents or stepchildren, or friends, you will need to draft a Will, as, under the Rules of Intestacy, none of these individuals would receive a penny. It is recommended that your Will should be reviewed periodically to ensure it reflects your current life situation and wishes. Major life events may effectively render your Will invalid; for example, if you get married. Given only 40% of the population have a Will, many millions of people are at risk of leaving behind a legacy of confusion and disagreement. An experienced solicitor who specialises in Wills and probate matters will not only ensure your Will is valid and encompasses all of the considerations needed (including many you may never have thought about), they will remain in a position to advise you as your life progresses. While you won’t benefit from a writing a Will yourself, you can rest assured that your affairs will be handled according to your wishes, and you have done all you have to protect your legacy once you are gone. Please note, this article does not constitute legal advice. Guillaumes LLP Solicitors is a full-service law firm based in Weybridge, Surrey. We have a highly experienced private client law team who can assist you with all matters relating to your Will. To make an appointment, please call us on 01932 840 111.